Keene Community Education is pleased to announce our sponsorship of a Machining Apprenticeship Program. Our program has been jointly approved by the United States Department of Labor and the New Hampshire Department of Education; Apprentices completing this two-year program will earn certificates from the NH Dept. of Education and the US Department of Labor. Machining apprentices take “related instruction” classes over the course of 1.5 years, totaling 300 hours. 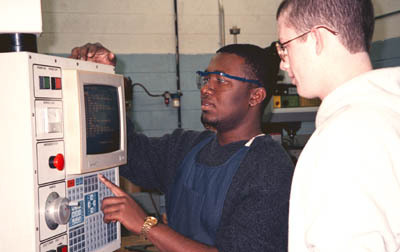 Apprentices may begin related instruction through Community Education without yet having secured a position with an area company as a machining apprentice. However, it is strongly recommended that students find such a position as soon as possible. This is a student responsibility. Apprentices are paid by their respective employers during the course of the two years. The related instruction is $975.00 for the full year, inclusive of all textbooks. Students who are employed as machining apprentices should check with their organizations regarding company policies for tuition payment/reimbursement. Click on the links below for an application or more information.